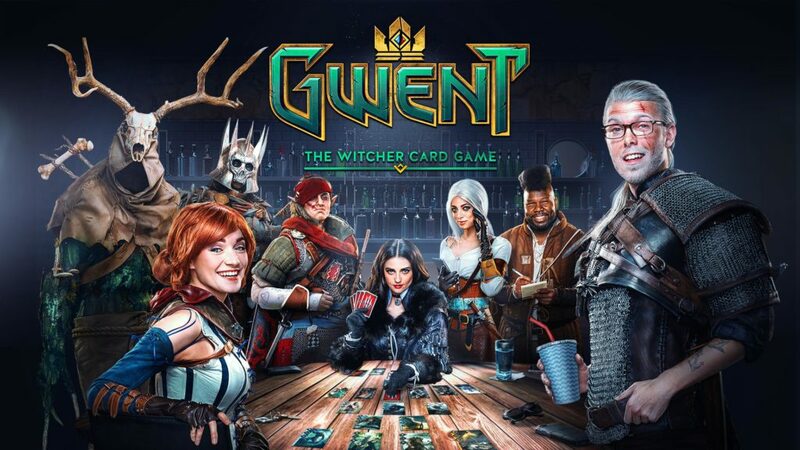 Note: This review is of the beta version of Gwent: The Witcher Card Game. I signed up for the closed beta of Gwent: The Witcher Card Game, sometime in July and didn’t give it much thought after that. Until, on the worst possible day, I received an email from CD Projekt inviting me to join the closed beta and download the game. That day was November 8th; I forgot about Gwent on the spot. So, for weeks, the email went ignored and the game unplayed. I have no idea how it happens that shock wears off and we manage to sort of get on with our lives. But, eventually, I remembered that I had a game to download and a review to write. And once I did play it, I immediately wished I had played it sooner. Gwent is a lighthearted, beautiful card game. Every detail in the art and sound design looks and feels extremely polished; while unique, its aesthetics do a great job at making us feel immersed in the Witcher universe. Good tutorials are one of the things that can make or break a game for me. Here’s a confession: I could never get past the tutorial level of The Witcher! It was so confusing, so busy, people kept attacking me while I had no idea which way was up. 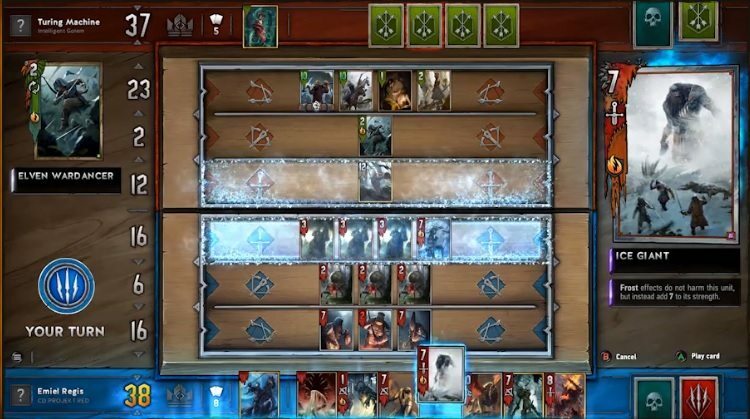 But, thankfully, this nightmare didn’t repeat itself in the subsequent Witcher games, and Gwent’s tutorial is perfect. I was first surprised by the visual effects, later by the delightful voice acting that comes with every card drawn. These little bits of dialogue by Witcher characters help the game feel more immersive, like a full-blown battle is taking place and it’s your job to keep your brave army alive. I am not good at keeping my brave army alive. Even though the tutorial makes the rules easy to follow, and the game seems uncomplicated enough, once you bring your troops into the real world (multiplayer), it takes skill and a well-curated deck to succeed. There is a deck-building tutorial as well, and the game helps you out by giving you five free cards after completing it, in the form of a free Barrel, which you have to open by visiting the Store. CD Projekt did a very business-savvy thing here; they made the card-acquisition process absolutely delightful. 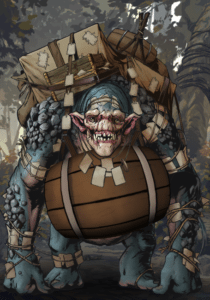 The shop attendant is a friendly, adorable troll, who smashes your barrel to let you get to your cards, and then gets SO excited with every card you reveal. Again, curating your deck is important. I didn’t put a lot of work into this, and I lost so many battles. So many. On the bright side, a sweet little feature called “Well Played” lets you send a tiny gift in the way of “scraps” to the other player at the end of the match. These scraps can be crafted into new cards to add to your deck. And you can also turn cards you don’t need into scraps, so even if you can’t spend money on barrels, you will get new additions to your deck if you play consistently. I wonder, though, if I will play consistently. How many lost battles can one Commander endure? A conversation with fellow WWAC writers made me think about this a lot. In most cases, being good at a game or not is no measure of how much fun we can have with it; it is totally okay to just want to send your favorite Witcher characters to inevitable death, collect cards, have a laugh with the troll. On to more technical concerns: to play Gwent: The Witcher Card Game, you need to download the GOG Galaxy client and sign up for an account. Honestly, this wasn’t exactly appealing to me (how many accounts can a person have!? ), but Gwent is an online multiplayer game, with a free-to-play business model, and it needs to track your activity and in-game purchases. So, once you make an account, you can play with strangers on automatic match mode or with friends that you invite yourself. Don’t forget to be a good sport and send your opponent some scraps after a game! I’m really excited for Gwent’s release and to see how its community grows. The game being free-to-play will obviously make a great incentive for new players to try it out; if you decide to play it at some point, maybe you will become a talented card wrangler, or not, but in any case I’m sure you will enjoy the experience.